Woodcraft new wide coverage toe guard offers a completely new shape offering better protection than has ever been available for a universal-fit toe guard. Coming at the guard from the side - this new guard has almost double the area of protection when compared to most current designs. The forward part of this guard has a sloped surface that covers the gap between the outside of the swingarm and the chain better than any standard guard we've ever seen. With this new style guard, the only gap between the actual guard and the chain is the clearance needed to avoid the guard contacting the chain. Woodcraft has worked hard to provide protection where previous guards have not. While no guard can prevent injury in every circumstance, the new Woodcraft Wide Coverage Toe Guard provides the most protection available on the market today. Special plastic formulation has excellent strength and saves weight over aluminum guards. The main plastic guard easily bolts to the aluminum mounting block and is replaceable. This kit comes with a mount kit that allows secure mounting even in thin walled swingarms (that are too thin for tapping threads). The aluminum mounting block for the guard needs a flat surface that is about 3 inches long and 3/4 inches wide. 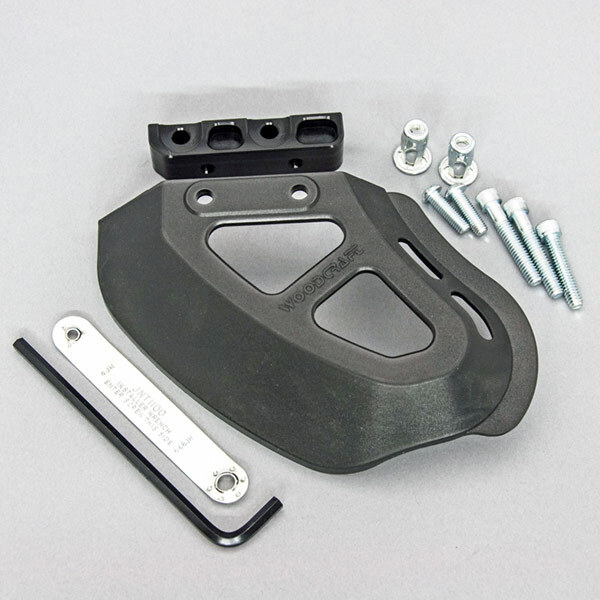 This universal kit works on most motorcycles, but you'll want to check your specific bike to ensure that you have a proper spot to mount the guard.